Following dinner at L'Espalier, my next major meal in Boston would land me at Craigie on Main, Tony Maws' temple of French-inspired “nose-to-tail refined rusticity” near the MIT campus. About the Chef: Maws was born in 1970, and grew up in Newton, MA, a city located just west of Boston. He was inspired early on by his Jewish grandmother from Tennessee, "Baba" Hannah Bluestein, who instilled in the young Chef a passion for "locavore," seasonal, nose-to-tail cooking. Maws attended the prestigious Belmont Hill School, and started his restaurant career at the age of 15, working as a dishwasher at the Beach Plum Inn in Martha's Vineyard. Eventually, he graduated with a degree in psychology from the University of Michigan, and like many liberal arts graduates, soon found himself unemployed. His solution was to travel through Europe for a year, and when he returned, Maws secured work as a waiter, again in Martha's Vineyard. During this stint, he applied to various kitchen positions throughout the US, and ended up being hired by Chris Schlesinger of East Coast Grill in Cambridge. 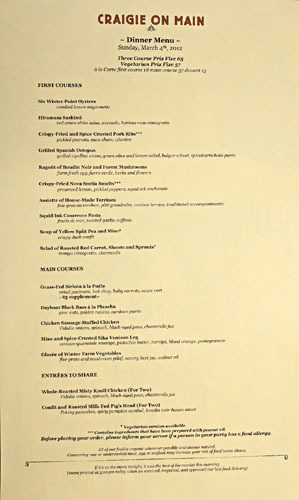 Maws worked for Schlesinger for over two years, and also cooked under Steve Johnson at the Blue Room, East Coast Grill's sister restaurant at the time. Maws then moved to Santa Fe, to work with Mark Miller at Coyote Cafe. From there, he transitioned to San Francisco, first cooking at Wolfgang Puck's Postrio before landing a gig at La Folie, under Roland Passot. The Chef then returned home to Boston, where he manned the stoves at Ken Oringer's seminal Clio for three years. During this time period, Maws traveled to France and worked at Larivoire, a Michelin-starred, classically French establishment near Lyon helmed by Chef Bernard Constantin (who'd trained under Paul Bocuse). He grew enamored with the bistrots modernes style of cooking there, which highlighted creative, yet simple and unpretentious cuisine made using fresh, local ingredients and classical technique, all served in a relaxed environment. Armed with this newfound inspiration, Maws returned to the US to launch Craigie Street Bistrot in 2003. 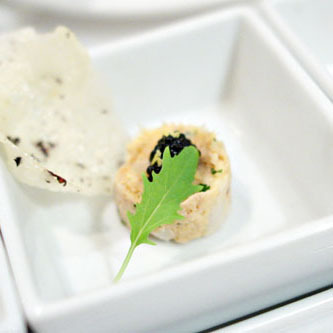 The place was a hit, and he was deemed one of "America's Best New Chefs" by Food & Wine in 2005. 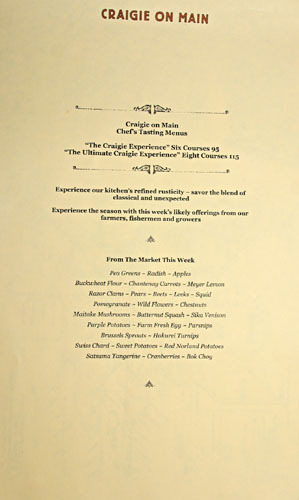 However, space was always a limitation at 5 Craigie Circle, and thus in November 2008, Maws debuted Craigie on Main in a much larger space not too far from the original location. 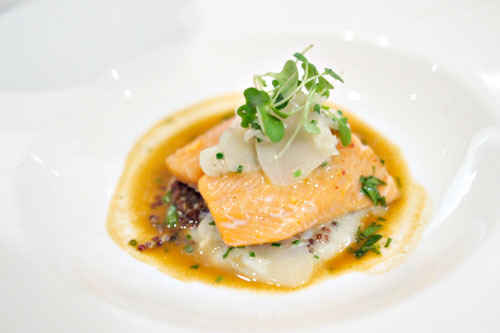 For this, he was nominated for James Beard's Best Chef Northeast award in 2009 and 2010, finally winning last year. The new, 90-seat space was transformed by architect and designer Peter Neimitz, who aimed to preserve the warmth and charm of the original Craigie Street Bistrot. The room features a bar on one end (they have a pretty serious cocktail program), and is dominated by an open kitchen anchored by a gleaming 12-by-6 Molteni cooking suite from France--a far cry from the tiny space that Maws cooked in at the old restaurant. 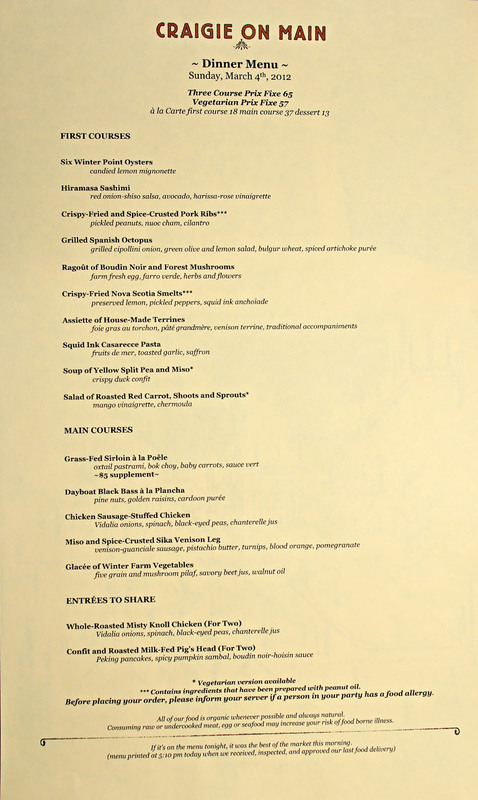 The Craigie on Main menu changes daily, and diners can chose from à la carte, prix fixe, or tasting menu options. 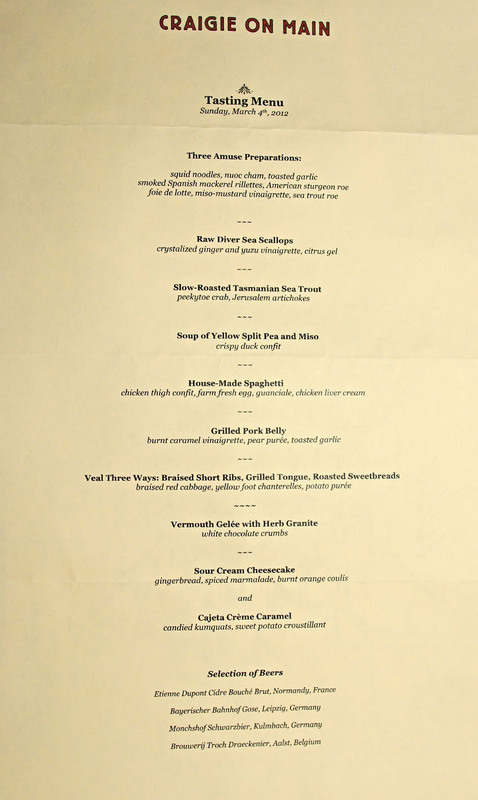 We, naturally, went for the eight-course "Ultimate Craigie Experience" at $115pp (spontaneously prepared this evening by Sous Chef Danny Scampoli), and asked our server to do a beer pairing along with it. Click for larger versions. 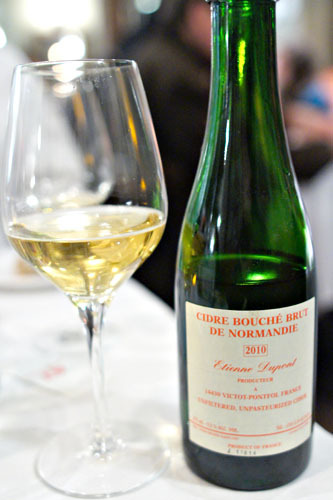 Our first libation wasn't a beer at all, but the fantastic Etienne Dupont Cidre Bouché Brut, Normandy, France [$17]. Think of this as adult apple juice, with a delicious apple sweetness, puckering tartness, and just enough barnyard funk to make it interesting. Bread, surprisingly, is not baked in-house, but rather comes from Iggy's, a well-regarded bakery in Cambridge. We commenced with a troika of little bites. 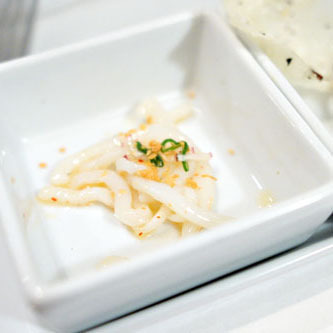 The squid noodles were delightful, snappy in texture with a delicate flavor, and beautifully accompanied by the pungent, tart, umami-laden smack of the nuoc cham and garlic. A rillettes of mackerel was also quite tasty, with a salty, smoky savor wonderfully enhanced by the briny tang of caviar. 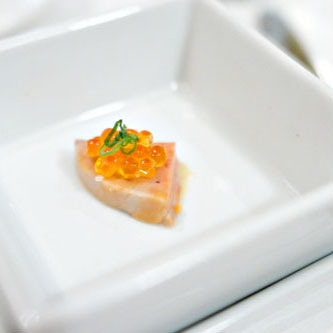 Last up was monkfish liver: rich, fishy, and salty, with a well-placed kick of salinity from the trout roe. A promising beginning. 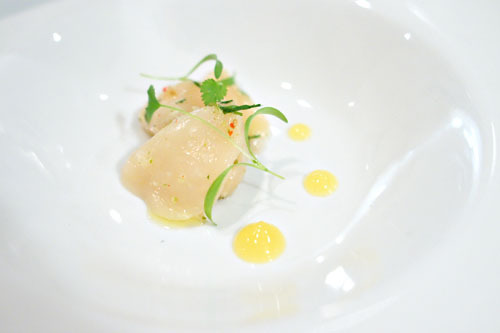 A sashimi of scallop formed our first course proper. 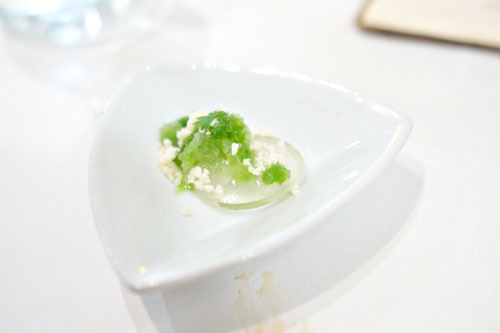 Bracingly fresh and mildly sweet, it was deftly matched with the tangy relish of the yuzu-ginger, while the greenery on the plate added a bright, almost minty note to the dish. Light and refreshing. A filet of sea trout was consummately cooked--tender and buttery, with a refined ocean-y taste, augmented by the inherent brine of the peekytoe crab. The seafood was nicely moderated by the various veggies at play, with the sweet, nutty sunchoke taking center stage in that regard. Even better was the red quinoa, which added an earthy gravity to complete the dish. 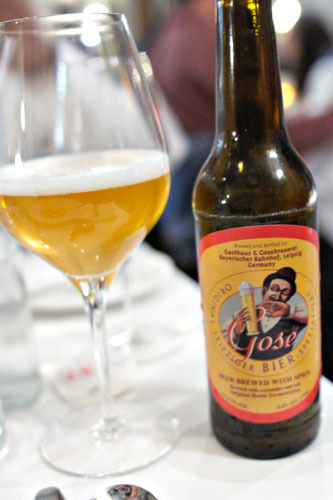 Next up to drink was the Bayerischer Bahnhof Gose, Leipzig, Germany [$12]. I believe that this was my first time trying a gose (not to be confused with a gueze), and I rather enjoyed the wheat beer. 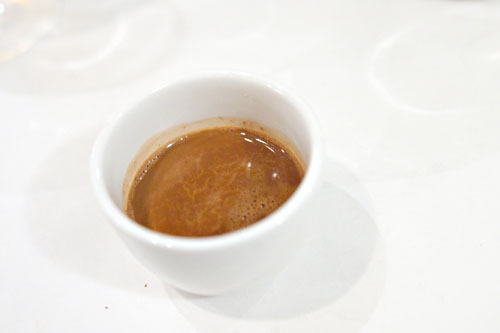 It showed off a refreshing citrus-y bite, which was wonderfully balanced by a slight bitterness and beautiful spice character. Very nice. A soup of split pea and miso was hearty and comforting, with a gorgeous, earthy weight and hint of warm spice from the use of paprika oil. 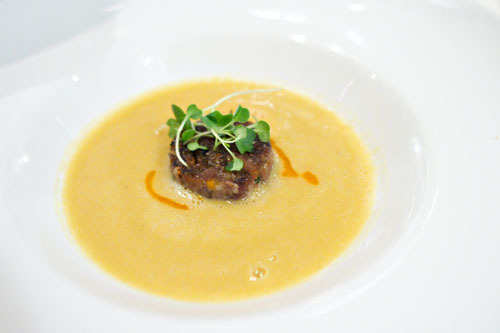 As good as the potage was, the crispy, confit'd duck added even more heft to the dish, with the deep, dark, delicious flavors of the bird shining bright and clear. Craigie's homemade spaghetti was on point as well, cooked to a pleasantly firm consistency that I appreciated. 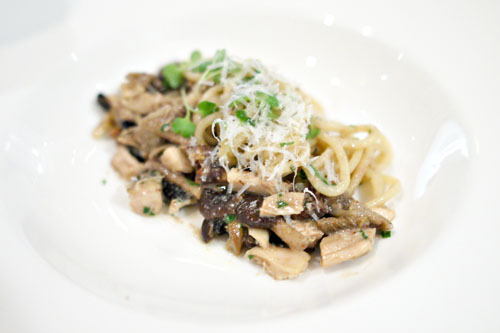 The chicken thigh conveyed a wonderful richness and savoriness that was superbly complemented by the gravity of the mushrooms. At the same time, the chicken liver contributed an overarching shroud of earthiness to the mix that deftly tied all the elements here together. Just about the heartiest spaghetti that I'd ever eaten. 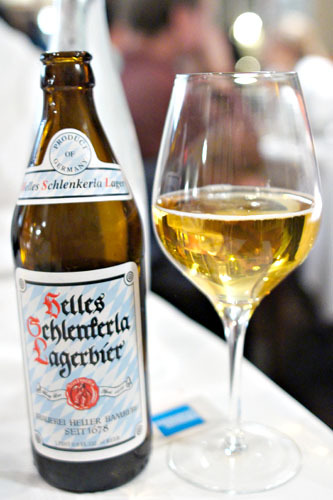 Here was another Deutsch Bier, the Schlenkerla Helles Lagerbier, Bamberg, Germany [$14]. I enjoyed this one as well, with its crisp, steely, slightly citric minerality up front, balanced by just the right amount of maltiness, all with fascinating overtones of smoke throughout. 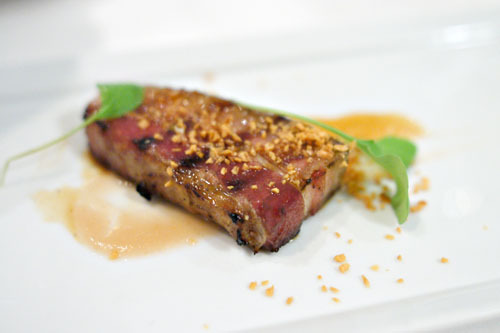 A striated slab of pork belly arrived in prototypically lush, rich, fatty fashion. Certainly tasty alone, it was taken to another level by its accoutrements of pear and caramel vinaigrette, which, when taken together, lent an adroit sweetness and almost Asian character to the dish. I adored the garlicky finish of the pork as well. And now, for the pièce de résistance, we were presented three different variations of veal. 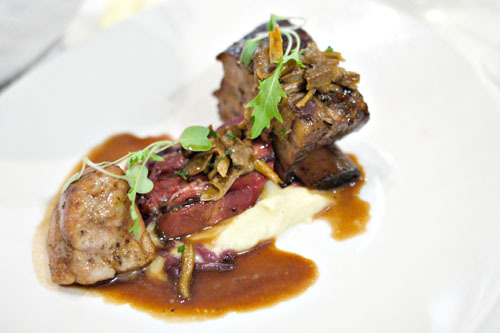 I began with the sweetbreads, which showed off a lot of finesse, along with a great depth of flavor. Its flavors, of course, weren't as deep, dark, or savory as that of the short ribs, which were cooked to an expectedly tender consistency. My favorite item on the plate was actually the tongue, with displayed a perfect mix of lean and fat, combined with the most robust, yet refined taste of the trio. With the savories out of the way, it was time for Pastry Chef Jessica Scott to shine. She started us off with a rather jarring pre-dessert, one that played the herbaceous sweetness of the gelée and granité combo against the unabashed sugariness of the chocolate. 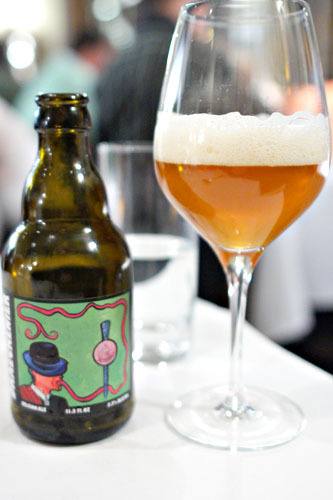 Our final beer of the evening was the Brouwerij Troch Draeckenier, Aalst, Belgium [$13]. This was a crisp tripel, with a delicately sweet, fruity backbone intermingled with a nice hint of spice and a yeasty twang. The first of our tandem desserts was the cheesecake, which managed to be one of the better preparations that I've had. 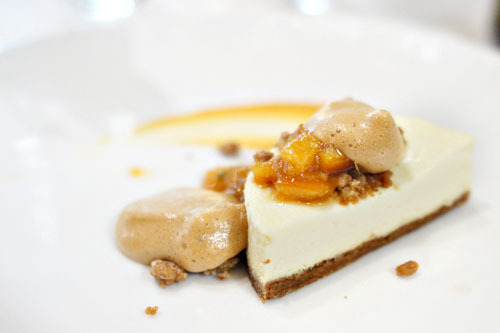 The sweet, creamy lactic tang of the cake and its spicy, crumbly gingerbread crust melded perfectly with each other, while the orange coulis gave the dessert a saccharine, smoky finish at the end. 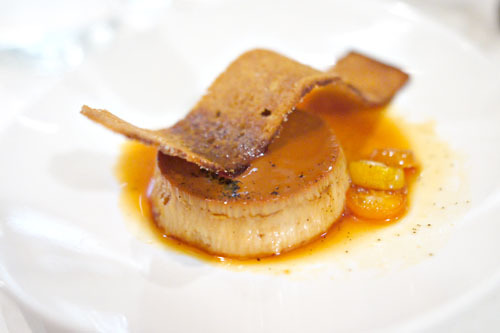 The cajeta crème caramel displayed all the classic flavors that you'd expect from a flan, with its unmitigated sugariness and dense, heavy body playing against a lovely tinge of smoke. I also appreciated the pricks of citrus-y tartness contributed by the kumquats, while the sweet potato tuile provided a much needed crunchiness to the dessert. Wrapping things up was a steaming cup of hot chocolate made with Valrhona, ancho chile, and cardamom, a beautiful blend of sweet and spicy flavors that just glided down my throat. 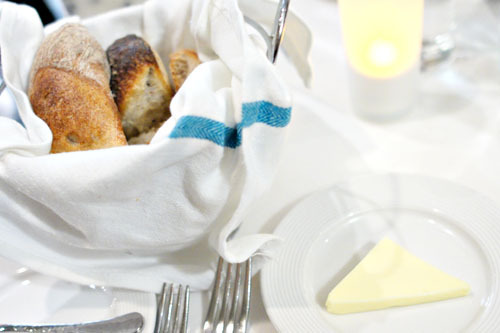 Overall, we enjoyed a satisfying meal here, with Tony Maws' labor of love really delivering exactly what it promised: elevated bistrot fare featuring local, seasonal produce that borders simultaneously on both rusticity and refinement. This blend of approachability and adventurousness seems like a winning combination, and I can see why this place is almost perpetually packed. Great post. When I saw your write-up on L'Espalier, I was hoping you also had a chance to stop by Craigie on Main. This brings back memories of my trip to Craigie in July of 2009. I too had the "Experience" and enjoyed a variation on the Veal Trio they were doing back then as well. The food was awesome, of course, but the other thing I'll never forget about the restaurant is that I was dining solo and a staff member gave me a copy of The Boston Globe so that I'd have a way to pass the time in between courses. A classy move that I haven't encountered anywhere else while dining by myself. Mmmm. This really looks tasty. We will be there in April and will definitely stop in. Thanks! Michael: Ha! I've had that happen at a couple of places. 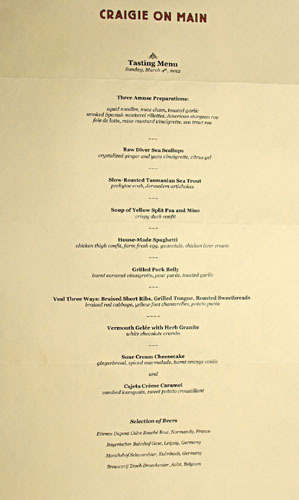 The first time was actually at the Ritz-Carlton Dining Room in San Francisco. Jan: So where else are you headed to in Boston? okay, so you hit my big two in Boston.